It is season 2 of DC’s Legend of Tomorrow and with the defeat of Vandal Savage at the end of season 1, we get a new voice over but this time it is Victor Garber’s Martin Stein introducing each team member and what their mission is and that is to protect history now that the Time Masters no longer exist. As the episode opens, the Legends are nowhere to be seen. Instead, we have Nate Heywood (Nick Zano) seeking Oliver Queen’s help in Star City to find the Legends. Heywood introduces himself as a historian/time detective and shows Oliver evidence of the Legends presence throughout different periods of time. Oliver decides to help because of Ray and Sara (also Heywood deduced he was the Green Arrow). The two take a submersible ship down the depth of the Atlantic and find the Waverider. Once inside, the find Rory in stasis and when Oliver and Heywood wake him up, he relates what the team was up to the last 6 months. We then see the team in 1637 France trying to protect King Louis XIII from assassins. The Legends do manage to achieve their mission but much to Rip’s chagrin still manage to make a mess of things by using their future tech. Vancouver filming fun fact: The house used for Louis XIII’s court is a house called Casa Mia in Vancouver. It is Spanish looking house that I’ve long admired every time I drive by it. 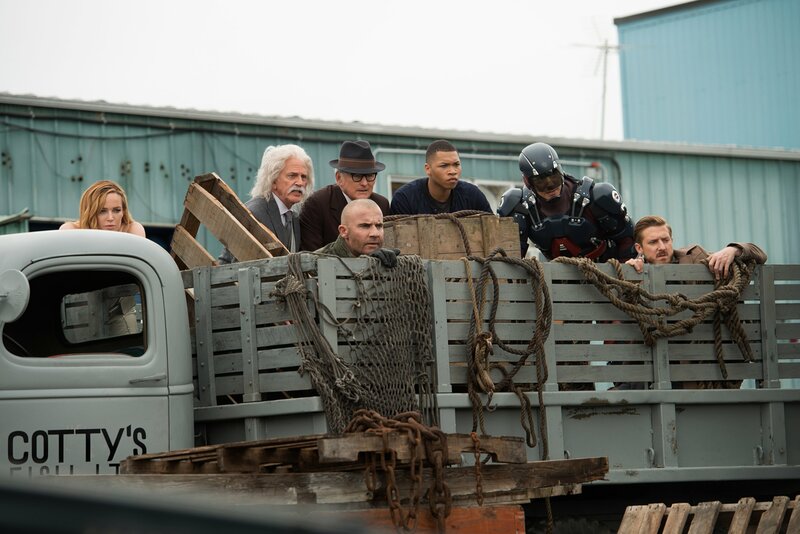 When the team return to the Waverider, they get alerted to their next possible mission: 1942 New York City. Rip realizes that this is the time period that Rex Tyler warned them about at the end of season 1. Ray says the team needs to ignore the warning or the Nazi’s will win WWII. Sara realizes that she could use the opportunity of being in 1942 to find Damien Darhk and get Gideon to help find him. As the team is doing more research on their mission, they discover that WWII ends two years later than it originally ended and that 12 million more people died. Also, the team are alerted to a newspaper article that states Albert Einstein (Jon Rubinstein) went missing in this time period. Stein deduces the Nazi’s kidnapped Einstein in order for him to finish the nuclear bomb for them. So the Legends know they need to kidnap Einstein. Rip tells Jax that he needs to stay behind with the ship while the rest head off to a party at Colombia University in honour of Einstein. Sara goes off on a separate mission while Ray follows her. Of course, Sara find Darhk at a warehouse selling uranium to the Nazi’s. Before Sara can go kill Darhk, Ray stops her as they need Darhk to lead them to the uranium. Back at the Colombia party to save Einstein and Rory, Rip and Stein eventually are able to whisk Einstein away on the Waverider. However, Sara and Jax learn that the time aberration still exists which means the nuclear or atomic bomb (as Einstein correctly calls it) still goes off. We learn that this is because the Nazi’s just kidnap Einstein’s ex-wife, who often collaborated with him, complete the bomb. Also, Ray rats out Sara for going after Darhk. The two have a spat with Sara saying that Ray is not a hero without his Atom suit but he says the suit can help find Darhk because of the uranium radiation on him. The Legends find Darhk at a shipyard in New Jersey. They see the bomb about to be loaded in a sub. The team goes to stop it from being loaded and also to protect Einstein’s ex. However, Sara goes after Darhk to kill him and avenge Laurel’s death. Back at the Waverider, Jax finally understand why Rip always wants him to look at the ship and that is so Rip feels like he can leave the ship in the hands of someone who knows it so well as he feels he won’t on it for long. Rip also gets Jax to implement something called a time scatter. So in order to stop the atomic bomb, Rip takes the Waverider to intercept it. To protect the Legends, Rip uses the Time Scatter that Jax installed to disperse the Legends throughout time except for Rory as he is too injured to survive. Rip places Rory in stasis and then steers the Waverider in the path of the atomic bomb. Stein and Jax in Medieval England as the King’s magician where I got a huge laugh at Jax using his iPhone as a magical object. As for Rip, Gideon plays a message to the Legends where it is pretty much a farewell message about going down with the ship and saying he is leaving history to the Legends and there is no better team to do so. I am not 100% sure if Arthur Darvill has left the show as there was no press articles about that. I think this might be a way to temporarily write him out while he is filming season 3 of Broadchurch. Let’s hope it is the latter. In order to fix things, the Legends go back to 1942 and get Einstein to credit his ex in their collaboration in his work. This public outing stops the Nazi’s from kidnapping her hence they are unable to use the atomic bomb. Darhk is not happy but says his partner is going to be even more unhappy and his partner is Eobard Thawn aka the Reverse-Flash who kills all of the Nazi’s on board the sub. With their mission accomplished, the Legends are ready to leave 1942 NYC but are stopped by the members of the Justice Society of America and I am so looking forward to episode 2 and meet them properly.